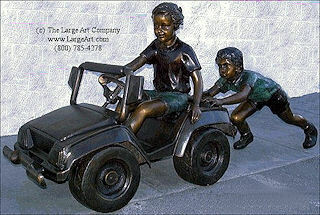 Two Boys Playing With Car is a large bronze sculpture measuring 34" tall x 25" wide x 75" long in size. Available with a multi-colored patina or a dark brown patina, this sculpture is suitable in a public play area as well as your own back yard! Measurements: 34" tall by 25" wide and 75" deep.